Hey there readers, I just wanted to take a moment to wish you all a very “Merry Christmas” if you are celebrating the holiday with us today. If you are celebrating something else that’s fine, then just have an amazing today if that is easily doable. For those celebrating Christmas, I hope that you have gotten and given out some nice presents for those who are in your circle and also that you’ve extended the kindness to a needy cause of some kind. If you haven’t, I am sure you can find some unused and in good condition clothes for a shelter, or toys for some kind of drive and maybe even old books to the library or a place like Housing Works where all the money goes for a great cause. Maybe feed a stray cat or consider adopting one that might be good company for your family for life. I know my Spooke will get some additional treats today and last night I left a big helping of food for these two related cats near my building but I digress. For this years photo, I’ve lightly modified the leather jacket from the way it has generally looked during the Trans-Siberian Orchestra shows. I used to add a few more ornaments on it, but several have broken over the years and just this past Saturday I learned that the flashing lights are NOT permitted in the arena. Oddly enough I wore them last year but the times they are a changing. I fear next year is going to be the Santa hat and the stocking only but oh well, this angle had a good run. 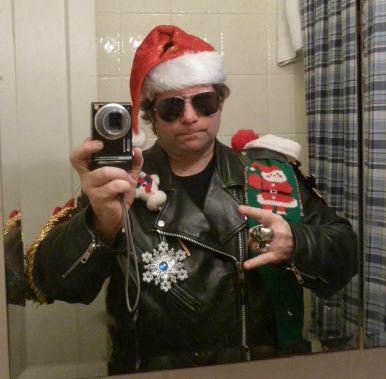 I just wanted to take a moment and wish all of those who are celebrating the day, a very Merry “Metal” Christmas today and offer up a seasonal image from the PiercingMetal High Command to your view screens. Also, with Hanukkah beginning last night, we wish all of those who celebrate that holiday the very best. Closing up I wish you a great day with those who matter most in your personal world. Spend that time with them because that is what counts the most when it all comes down to it. Thanks for reading the website and following us on the various Social Networks and just keeping our words in play. To me you are as awesome as the rock stars that we speak about in each and every piece of work. I’ll be back with the regular posts soon as we help send off 2016 to its close. While scanning the Spotify channels for some suitable holiday fare to add to the review archives I chanced upon this single that was released back in 2013 by the band Operatika Element and is very simply entitled “Merry Christmas”. The tune starts with a rousing wish and then continues its flow with positive energy and a wonderful grasp of the holiday mood that this season puts so many people in. After the first listen I found myself singing along with their lead singer Slava Popova who is accompanied by keyboardist Anna Dok. Keyboards are abundant in the tune and come care of both Dok and Boris Zaks while guitar work is the talents of Richard Fischer. Drums are not really something prominent in the tune based on its more contemporary vibe but they are delivered with skill by Yuri. This is without question a very warm and easily accessible holiday tune that puts you in the proper mood for the occasion and also one that could easily fit on numerous radio stations around this time of the year. The band also plays heavier stuff but this single is all about the wider audience and that is never a bad thing if you can pull it off successfully. Nice work folks, hopefully you’ll do another holiday tune in the future since you have the chops to do a good one and this is not so easily done. Readers who find the name somewhat similar to their ears should be aware that this is a newfangled lineup from the Symphonic Power Metal band Operatika. Grab this download as it will only set you back a buck. A link is provided below. 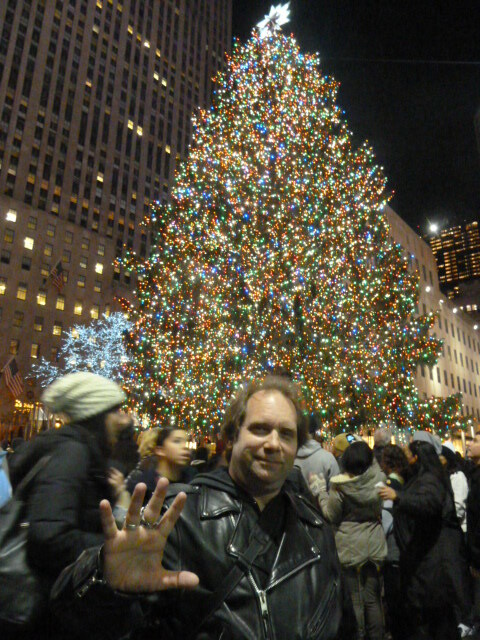 I took a trek up to Rockefeller Center to see the famous Christmas Tree. Its really a spectacle and I asked these nice Japanese tourists if they would indulge me with a photograph. I had just taken one of them and also tried to convince them to come to see the band Vamps who were playing the day after when this photo was taken. I wonder if they listened. I went to see the Trans-Siberian Orchestra the other day and yes I did actually do this to my leather jacket. Its the perfect way to use some decorations that have been just sitting in a box in my closet. It always goes over with the folks I know and each year it gets a little different. I already have next years prep in mind. As I have mentioned the famous tree just above, if you click the photo below of the Rockefeller Center Christmas Tree you will be instantly transported over to my PiercingKen.com Blog and its annual “Christmas Visuals” post. I’ve been doing that kind of post over there for some time so please do come visit, I think you might enjoy it. 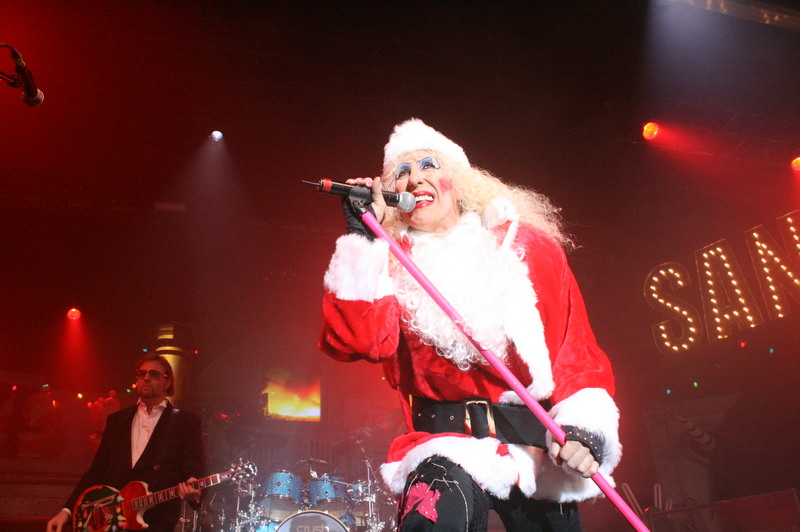 Early last week I went to Webster Hall to enjoy a Holiday Mixer and readers know how PiercingMetal has reviewed and photographed shows at each of the venues three venues on the site. 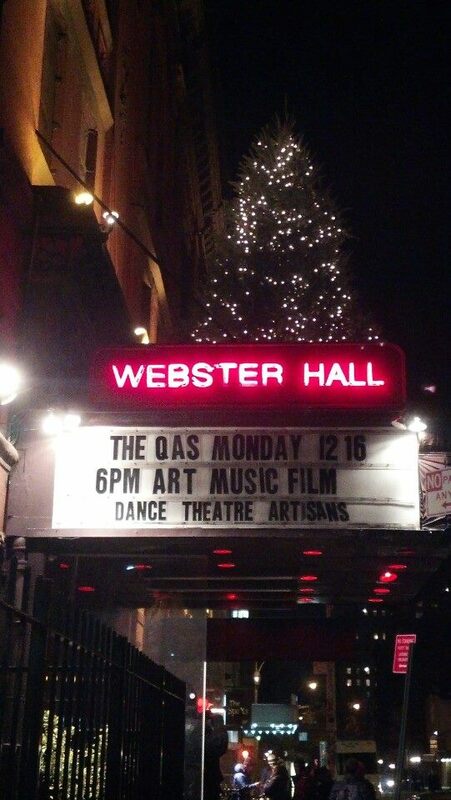 Since they had a big tree on the top of the marquee, we snapped a photo of it. Now its time for me to go but I do wish all of you a very Merry Christmas and to our friends who are celebrating other holidays we hope that they were absolutely wonderful for you. I will see you around the Metal realm for sure as soon as 2014 begins and there is a lot to bring to your attention so stay tuned and keep up on our Social Network links so you know about everything as soon as I press “Go!”.